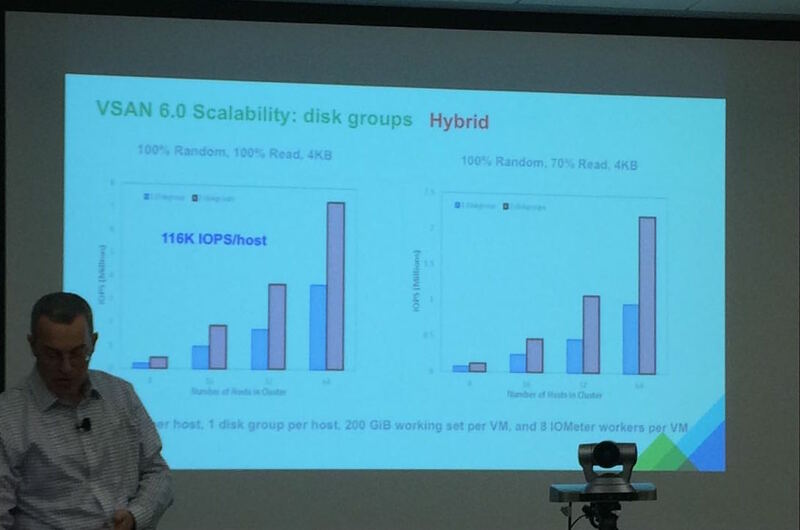 We visited with VMware’s VSAN team during last Storage Field Day (SFD7, session available here). The presentation was wide ranging but the last two segments dealt with recent changes to VSAN and at the end provided some performance results for both a hybrid VSAN and an all-Flash VSAN. Even in the all-flash configuration there are two tiers of storage a write cache tier and a capacity tier of SSDs. These are configured with two different classes of SSDs (high endurance/low-capacity and low-endurance/high capacity). 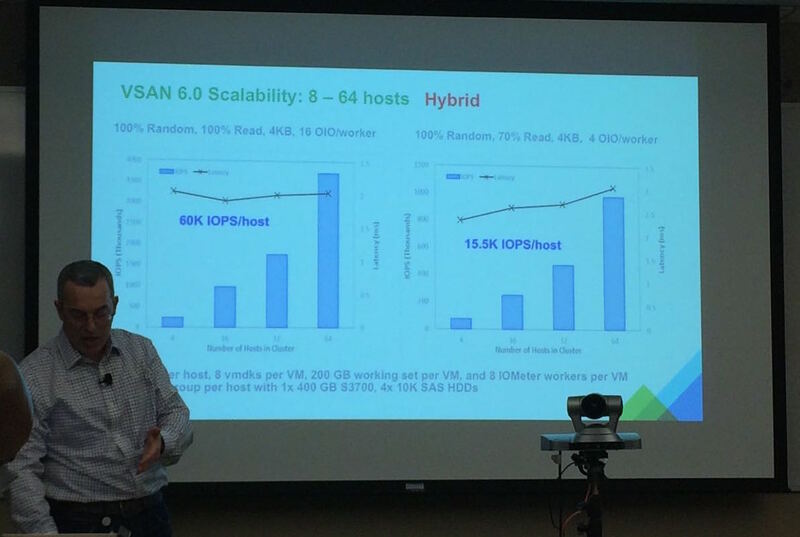 At the end of the session Christos Karamanolis (@Xtosk), Principal Architect for VSAN showed us some performance charts on VSAN 6.0 hybrid and all-flash configurations. On the chart we see two plots showing IOmeter performance as VSAN scales across multiple nodes (hosts), on the left we have a 100% Read workload and on the right a 70%Read:30%Write workload. The hybrid VSAN configuration has 4-10Krpm disks and 1-400GB SSD on each host and ranges from 8 to 64 hosts. The bars on the chart show IOmeter IOPS and the line shows the average response time (or IO latency) for each VSAN host configuration. I am not a big fan of IOmeter, as it’s an overly simplified, but that’s what VMware used. The results show that in a 100% read case the hybrid, 64 host VSAN 6.0 cluster was able to sustain ~3.8M IOPS or over 60K IOPS per host. or the mixed 70:30 R:W workload VSAN 6.0 was able to sustain ~992K IOPs or ~15.5K IOPS per host. We see a pretty drastic IOPs degradation (~1/4 the 100% read performance) in the plot on the right, when they added write activity to the mix. But with VSAN’s mirrored data protection each VM write represents at least two VSAN backend writes and at a 70:30 IOmeter R:W this would be ~694K IOPS read and ~298K IOPS write frontend IOs but with mirroring this represents 595K writes to the backend storage. Then of course, there’s destage activity (data written to SSDs need to be read off SSD and written to HDD) which also multiplies internal IO operations for every external write IOP. Lets say all that activity multiplies each external write by 6 (3 for each mirror: 1 to the write cache SSD, 1 to read it back and 1 to write to HDD) and we multiply that times the ~298K external write IOPS, it would add up to about a total of ~1.8M write derived IOPS and ~0.7M read derived IOPS or a total of ~2.5M IOPS but this is still far away from the 3.5M IOPS for 100% read activity. I am probably missing another IO or two in the write path (maybe Virtual to physical mapping structures need to be updated) or have failed to account for more inter-cluster IO activity in support of the writes. In addition, we see the IO latency was roughly flat across the 100% Read workload at ~2.25msec. and got slightly worse over the 70:30 R:W workload, ranging from ~2.5msec. at 4 hosts to a little over 3.0msec. with 64 hosts. Not sure why this got worse but hosts are scaled up it could induce more inter-cluster overhead. In the chart to the right, we can see similar performance data for systems with one or two disk-groups. The message here is that with two disk groups on a host (2X the disk and SSD resources per host) one can potentially double the performance of the systems, to 116K IOPS/host on 100% read and 31K IOPS/host on a 70:30 R:W workload. Here we can see performance data for an 8-host, all-flash VSAN configuration. In this case the chart on the left was a single “disk” group and the chart on the right was a dual disk group, all-flash configuration on each of the 8-hosts. The hosts were configured with 1-400GB and 3-800GB SSDs per disk group. The various bars on the charts represent different VM working set sizes, 100, 200, 400 & 600GB for the single disk group chart and 100, 200, 400, 800 & 1200GB for dual disk group configurations. For the dual disk group, the 1200GB working set size is much bigger than a cache tier on each host. The chart text is a bit confusing: the title of each plot says 70% read but the text under the two plots says 100% read. I must assume these were 70:30 R:W workloads. 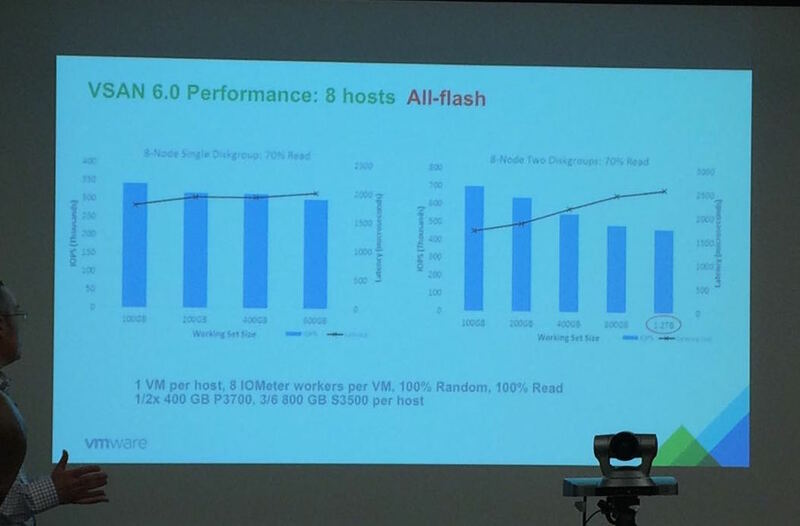 If we just look at the 8 hosts, using a 400GB VM working set size, all-flash VSAN 6.0 single disk group cluster was able to achieve ~37.5K IOPS/host and with two disk groups, the all-flash VSAN 6.0 was able to achieve ~68.75K IOPS/host at the 400GB working set size. Both doubling the hybrid performance. Response times degrade for both the single and dual disk groups as we increase the working set sizes. It’s pretty hard to see on the two charts but it seems to range from 1.8msec to 2.2msec for the single disk group and 1.8msec to 2.5 msec for the dual disk group. The two charts are somewhat misleading because they didn’t use the exact same working group sizes for the two performance runs but just taking the 100|200|400GB working set sizes, for the single disk group it looks like the latency went from ~1.8msec. to ~2.0msec and for the dual disk group from ~1.8msec to ~2.3msec. Why the higher degradation for the dual disk group is anyone’s guess. The other thing that doesn’t make much sense is that as you increase the working set size the number of IOPS goes down, worse for the dual disk group than the single. Once again taking just the 100|200|400GB working group sizes this ranges from ~350K IOPS to ~300K IOPS (~15% drop) for the single disk group and ~700K IOPS to ~550K IOPS (~22% drop) for the dual disk group. Increasing working group sizes should cause additional backend IO as the cache effectivity should be proportionately less as you increase working set size. Which I think goes a long way to explain the degradation in IOPS as you increase working set size. But I would have thought the degradation would have been a proportionally similar for both the single and dual disk groups. The fact that the dual disk group did 7% worse seems to indicate more overhead associated with dual disk groups than single disk groups or perhaps, they were running up against some host controller limits (a single controller supporting both disk groups). At the time (3 months ago) this was the first world-wide look at all-flash VSAN 6.0 performance. The charts are a bit more visible in the video than in my photos (?) and if you want to just see and hear Christos’s performance discussion check out ~11 minutes into the final video segment. Move over Dropbox, Box and all you synch&share wannabees, there’s a new synch and share in town. 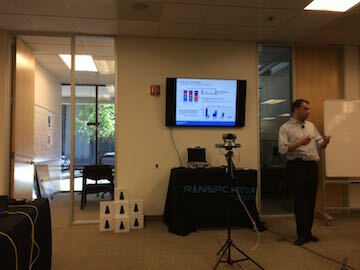 At SFD7 last month, we were visiting with Connected Data where CEO, Geoff Barrell was telling us all about what was wrong with today’s cloud storage solutions. In front of all the participants was this strange, blue glowing device. As it turns out, Connected Data’s main product is the File Transporter, which is a private file synch and share solution. All the participants were given a new, 1TB Transporter system to take home. It was an interesting sight to see a dozen of these Transporter towers sitting in front of all the bloggers. I was quickly, established a new account, installed the software, and activated the client service. I must admit, I took it upon myself to “claim” just about all of the Transporter towers as the other bloggers were still paying attention to the presentation. Sigh, they later made me give back (unclaim) all but mine, but for a minute there I had about 10TB of synch and share space at my disposal. So what is it. The Transporter is both a device and an Internet service, where you own the storage and networking hardware. 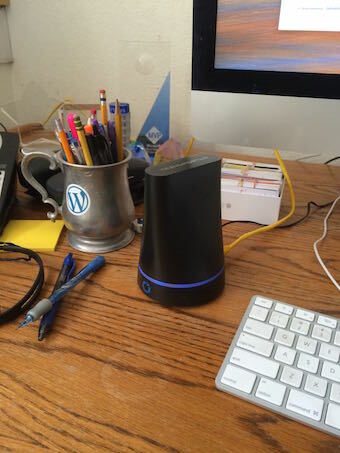 The home-office version comes as a 1 or 2TB 2.5” hard drive, in a tower configuration that plugs into a base module. The base module runs a secured version of Linux and their synch and share control software. As tower power on, it connects to the Internet and invokes the Transporter control service. This service identifies the node, who owns it, and provides access to the storage on the Transporter to all desktops, laptops, and mobile applications that have access to it. At initiation of the client service on a desktop/laptop it creates (by default) a new Transporter directory (folder). Files that are placed in this directory are automatically synched to the Transporter tower and then synchronized to any and all online client devices that have claimed the tower. Apparently you can have multiple towers that are claimed to the same account. I personally tested up to 10 ;/ and it didn’t appear as if there was any substantive limit beyond that but I’m sure there’s some maximum count somewhere. A couple of nice things about the tower. It’s your’s so you can move it to any location you want. That means, you could take it with you to your hotel or other remote offices and have a local synch point. Also, initial synchronization can take place over your local network so it can occur as fast as your LAN can handle it. I remember the first time I up-synched 40GB to DropBox, it seemed to take weeks to complete and then took less time to down-synch for my laptop but still days of time. With the tower on my local network, I can synch my data much faster and then take the tower with me to my other office location and have a local synch datastore. (I may have to start taking mine to conferences. Howard (@deepstorage.net, co-host on our GreyBeards on Storage podcast) had his operating in all the subsequent SFD7 sessions. The Transporter also allows sharing of data. Steve immediately started sharing all the presentations on his Transporter service so the bloggers could access the data in real time. They call the Transporter a private cloud but in my view, it’s more a private synch and share service. The Transporter people were all familiar to the SFD crowd as they were formerly with Drobo which was at a previous SFD sessions (see SFD1). 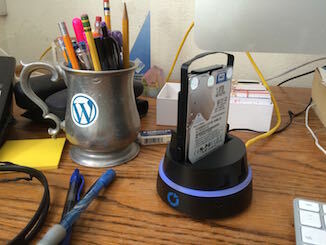 And like Drobo, you can install any 2.5″ disk drive in your Transporter and it will work. There’s workgroup and business class versions of the Transporter storage system. The workgroup versions are desktop configurations (looks very much like a Drobo box) that support up to 8TB or 12TB supporting 15 or 30 users respectively. The also have two business class, rack mounted appliances that have up to 12TB or 24TB each and support 75 or 150 users each. The business class solution has onboard SSDs for meta-data acceleration. Similar to the Transporter tower, the workgroup and business class appliances are bring your own disk drives. Geoff’s discussion (see SFD7 video) was a tour of the cloud storage business model. His view was that most of these companies are losing money. In fact, even Amazon S3/Glacier appears to be bleeding money, although this may not stop Amazon. Of course, DropBox and other synch and share services all depend on cloud storage for their datastores. So, the lack of a viable, profitable business model threatens all of these services in the long run. But the business model is different when a customer owns the storage. Here the customer owns the actual storage cost. The only thing that Connected Data provides is the client software and the internet service that runs it. Pricing for the 1TB and 2TB transporters with disk drives are $150 and $240. One thing I don’t like is the lack of data-at-rest encryption. They use TLS for data transfers across your LAN and the Internet. But the nice thing about having possession of the actual storage is that you can move it around. But the downside is that you may move it to less secure environments (like conference hotel rooms). And as with the any disk storage, someone can come up to the device and steel the disk. Whether the data would be easily recognizable is another question but having it be encrypted would put that question to rest. There’s some indication on the Transporter support site that encryption may be coming for the business class solution. But nothing was said about the Transporter tower. On the Mac, the Transporter folder has the shared folders as direct links (real sub-folders) but the local data is under a Transporter Library soft link. It turns out to be a hidden file (“.Transporter Library”) under the Transporter folder. When you Control click on this file your are given the option to view deleted files. You can also do this with shared files as well. One problem with synch and share services is once someone in your collaboration group deletes some shared files they are gone (over time) from all other group users. Even if some of them wanted them. Transporter makes it a bit easier to view these files and save them elsewhere. But I assume at some point they have to be purged to free up space. When I first installed the Transporter, it showed up as a network node on my finder shared servers. But the latest desktop version (3.1.17) has removed this. Also some of the bloggers complained about files seeing files “in flux” or duplicates of the shared files but with unusual file suffixes appended to them, such as ” filename124224_f367b3b1-63fa-4d29-8d7b-a534e0323389.jpg”. Enrico (@ESignoretti) opened up a support ticket on this and it’s supposedly been fixed in the latest desktop and was a temporary filename used only during upload and should have been deleted-renamed after the upload was completed. I just uploaded 22MB with about 40 files and didn’t see any of this. I really want encryption as I wanted one transporter in a remote office and another in the home office with everything synched locally and then I would hand carry the remote one to the other location. But without encryption this isn’t going to work for me. So I guess I will limit myself to just one and move it around to wherever I want to my data to go.